'99-04 Mustang GT Supercharger Kits. 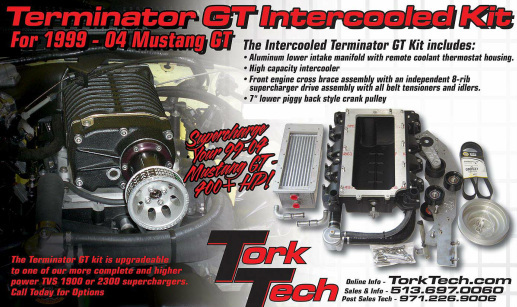 Mustang Terminator GT Kit - $90 Off ! Our popular Termi GT kit allows our customers to mount a '03/04 Cobra blower (or any Cobra aftermarket unit) on to your 2V 4.6L/5.4L engine! These positive displacement kits will destroy our competitors on a Fun-To-Drive basis with their huge torque & HP from idle to red line...NOT JUST ABOVE 4000 RPM where centrifugals make power. SEE THIS LINK for more details. CLICK TO ENLARGE - Data shown is at the engine, not wheels. Trick Flow Racing shared these TVS 1900 dyno results with us from their test car that has their new 2V heads. 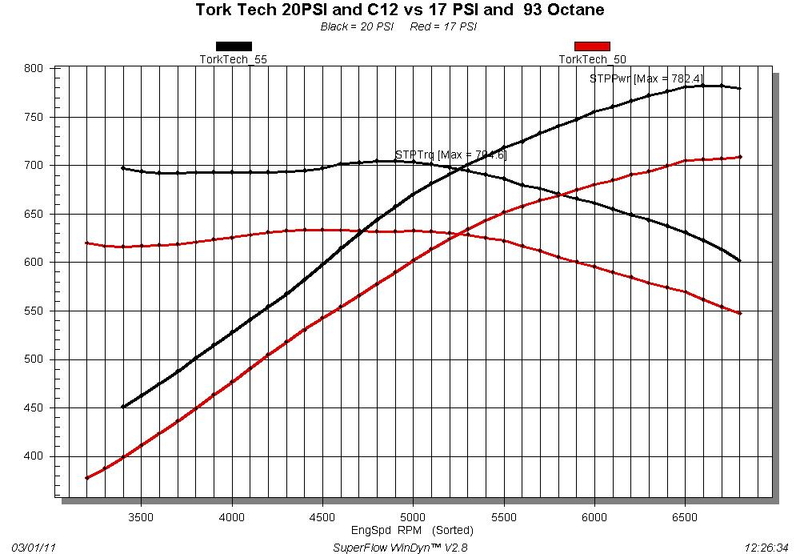 On pump gas @ 17psi = 708 HP (red curve) and results on race fuel @ 20psi = 782 HP (black curve). See the "Dyno Charts" section of our site for many more detailed customer dyno charts. The car shown in the video above is a '99 Saleen Speedster owned by George Lewis of Centerport Car Care (Tel. 631.261.4277) located in New York. George welcomes your calls if you would like to learn more about his project or need a shop to install a Tork Tech kit or even duplicate his setup with a built engine and chassis mods. His M112 kit makes nearly 600 RWHP! See the "VIDEOS" section of our website for many more cool videos of our products.